Made of high-grade 316L Stainless Steel with 925 Sterling Silver Plating for Endless Shine and Durability. This 4pcs jewelry sets featuring sparkling round Cubic Zirconia stones with halos of smaller CZ set, that looks shining and luxury. PACKAGING: 1 necklace + 1 pair of earrings + ring + 1 bracelet), comes with fashion jewelry box. 2.Nickel free and anti-allergic,and the metal surface is of high polished finish. 3.We offer our customer high quality jewelry with Brilliant colour,all material we use are almost environmentally friendly. Place : Daily Wear/Party /Wedding /Engagement/Birthday /Anniversary/Bridal/Valentine's Day/a special Day. Top Material and Skillfully Manufactured：Highest Quality standards in Fashion Jewelry,the Best material. STI-JEWELS is a premium brand for the fashion jewelry with import crystals, and offers beautiful and elegant design jewelries for all ladies and girls. All of the jewelries are ideal as a gift to yourself or loved ones. How to Maintenance Bracelet Jewelry? 1. All purchase delivered by AMAZON. 2. If no stock in AMAZON, deliver will be from China, it take 1-2weeks. 3.Good Service:If you have any question before you r purchasing or after you receive products, feel free to contact us, and we will reply you within 24 hours. 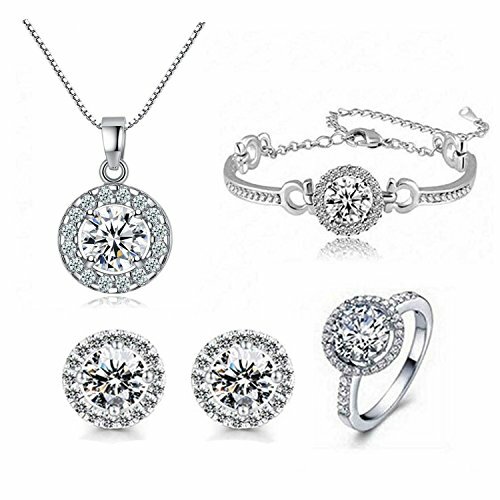 ♥CLASSIC DESIGN♥ - Women fashion jewelry sets with round cubic zirconia posts,Great gift for yourself, your daughter, girlfriend or families, or best friends on birthday, Christmas,Anniversary,Mother's Day, etc. It will undoubtedly catch her heart. ♥FEATURES♥ - Ring's size: 5,6,7,8,9,10; Designed by a senior designer, 4 piece cubic zircon jewelry sets. ♥MATERIAL♥ - High clarity, no allergies,Environmental friendly and Hypoallergenic + AAAA+Cubic Zirconia.Suitable for any occasion, easy to match with clothes, perfect jewelry to expand a woman's fashion wardrobe with a timeless, classic style. ♥100% GUARANTEE♥ - Your purchase is protected by a 30-day money back guarantee: you can return it for a full refund in case any quality problem. We offer our customer high quality jewelry with Brilliant colour,all material we use are almost environmentally friendly. ♥PACKING♥ - 1 necklace + 1 pair of earrings + 1 ring + 1 bangle bracelet, comes with a free beautiful gift box.For the jewelry set to always shine,be sure not to wear your jewelry while cleaning or working with harsh chemicals,or while playing sports. If you have any questions about this product by STI-JEWELS, contact us by completing and submitting the form below. If you are looking for a specif part number, please include it with your message.